Pruning is a practice that is periodically required on all woody landscape plants. Click on a tab below for more information on each aspect of pruning. On mature trees, pruning is required to remove dead and dying branches to maintain plant health and safety. This pruning type is referred to as cleaning. Research has now documented that thinning, the removal of live branches to reduce density, significantly reduces wind resistance and subsequent storm damage. Thinning should only be done on trees where the crown is "too dense" and a Bartlett Arborist has training and experience to evaluate this attribute. Thinning should be concentrated on the outer portions of the canopy, leaving as many branches on the interior crown as possible. In some instances, the crown or individual branches require reduction in length to improve the form and shape of the plant, to eliminate interference with objects and structures, and to compensate for structural weaknesses. Lower branches may require pruning for similar reasons. This process, known as raising, also can be used to increase the amount of light for turf grass and ground covers beneath the crown of a tree. Bartlett arborists are trained to evaluate the condition of your trees and determine the type(s) of pruning required to balance your goals and those of managing plant health and safety. One aspect of pruning that is most frequently overlooked by consumers is structural pruning of young trees. Trees evolved in forests where they tend to grow straight and lose lower branches due to competition for light. When planted in full sun in the landscape, many species tend to develop multiple stems/leaders that are more prone to failure. Lower branches tend to grow at the same rate as the terminal leader that results in weak attachments that also are likely to fail later in the life of the plant. So pruning trees when they are young and growing quickly is critical to ensuring a strong framework for future growth. This pruning focuses on maintaining a single dominant stem unless multiple stem "clumps" are specifically desired. Branches are pruned so their size remains proportional to the stem diameter at their point of attachment. As trees grow, some branches are removed to ensure adequate spacing between permanent scaffold limbs. The shape of the tree is maintained to provide a natural open grown form typical of the species. Bartlett arborists can also develop and maintain formal pruning styles including pollarding, espalier, pleaching, and topiary. Fruit tree pruning is becoming increasingly popular as more consumers grow apples, pears, citrus, and other fruit bearing plants in their gardens. Vista pruning, which is judicious removal of branches to enhance a specific view from a defined location, is also frequently performed especially for consumers with homes near mountains or the shore. People are often surprised to learn that Bartlett specializes in pruning shrubs, but if we can routinely prune 75-foot trees, the Rhododendron in your foundation planting is easy in comparison. 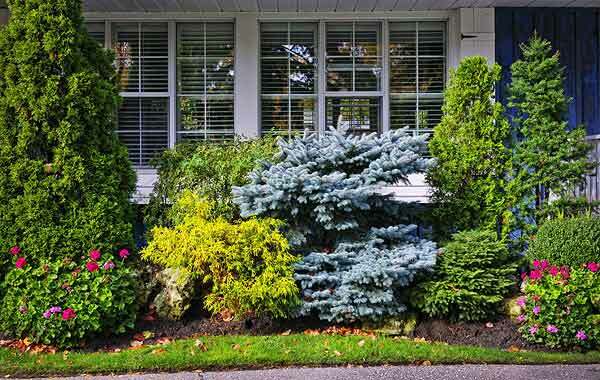 Homeowners and landscape professionals often confuse shearing and pruning: they are very different concepts that produce very different results. Shearing removes a portion of new growth each time it is performed. It produces an artificial shape that usually resembles a sphere, oval, cube or rectangle rather than the natural form of the plant. Shearing produces a formal appearance with a dense outer shell of foliage with little growth on interior portions of the crown. Because only a portion of the new growth is removed, the plant continues to grow larger each year and eventually it can out-grow its space. Pruning removes older growth as well as new shoots. Because cuts are made deeper into the crown, the plant has a "looser" informal and natural appearance that can be maintained according to the plant species or variety. Because pruning removes some older branches, a specific size can be maintained for the space allotted for them. Shearing is appropriate for formal gardens and for hedges. However for individual plants pruning is the better technique to sustain plant health and appearance over time.